Mumbai: Four coaches of a suburban train derailed near Mahim station on the Harbour Line today morning, injuring five passengers, Western Railway said. The derailment affected train movement on the Wadala-Andheri section, a railway official said. The local train, which started from Chhatrapati Shivaji Maharaj Terminus (CSMT), was on its way to Andheri station when a problem was detected in the overhead equipment (that supplies power for train movement) near Mahim station. Efforts were on to rerail the coaches as soon as possible, he said. “Restoration of 4 coaches of CSMT-Andheri Dn Harbor local expected in 3 hrs.5 psngrs with minor injuries gvn 1st aid,” Western Railway said in a tweet. Train movement on the Wadala-Andheri section was affected due to the derailment. However, all western main lines in the Churchgate-Virar section were unaffected, Mr Bhatkar said. A major tragedy averted on Tuesday at Nagpur railway station after the Sampark Kranti Express left the platform no 1 and an alert senior train ticket examiner detected a rail fracture at the Itarsi end. The caution was felt after it was noticed that three coaches of the train jumped while moving and the movement too was not smooth. Sources said senior TTE Jitendra Kumar Hathel, The TTE suspected something wrong, and noticed the rail fracture on the railway line when he checked the spot. He immediately rushed to the deputy station superintendent (Dy.SS) office at platform number 1 and informed the staff there. The Utkal Express derailment in Uttar Pradesh where 23 died was allegedly caused because the engineering department was carrying out ‘unofficial’ maintenance to repair tracks. This means that a ‘line block’ permission to slow down trains on a section of track or divert them through the other track was not taken from the Operations Department, which ultimately led to the train running on weak tracks and derailing. Such a situation is unlikely to happen in the Chennai division of Southern Railway, say official sources. This is because, two years ago, the division devised a systematic method of handling track renewal works which would have to be requested a day in advance. For instance, on Monday evening, Southern Railway issued a press release that there would be line and power block on Chennai-Gudur section to facilitate engineering works for constructing a limited use subway at Nayadupeta. “The engineering department has to send in their requests a day in advance. This will be sent to a senior official of the divisional operating department who will either give permission or reject it. But in any case, the process will be on paper by the previous day evening,” said a senior railway official. A dedicated log is also maintained which can nail those flouting rules. This was devised based on learnings from Mumbai railway division, say sources. This prevents shortcuts from the section engineers on the field and also gives them enough time to channelize manpower and resources for the work. Track renewal work is very important as most important lines in Indian Railways are over-stressed. But due to high frequency of trains, maintenance time for tracks is less. “Planning in advance helps iron out the inter-departmental differences and also improve safety ,” another official said. Suresh Prabhu offers to quit for 2 accidents in 4 days. He tweeted that he met the Hon’ble Prime Minister Narendra odi taking full moral responsibility. 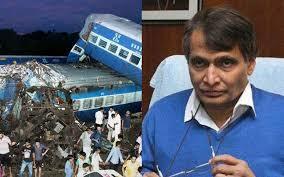 He also said that he is extremely pained to the losses of lives due to train accidents. He said he took moral responsibility for the accidents that have caused him deep anguish over the loss of lives. He said he met PM Narendra Modi, who asked him to wait. This is what the minister tweeted over the last 10 minutes. “In less than three years as Minister, I have devoted my blood and sweat for the betterment of the Railways. Under the leadership of PM, tried 2 overcome decades of neglect thru systemic reforms in all areas leading 2 unprecedented investment & milestones. In back-to-back rail accidents, As many as 74 passengers were injured as nine bogies of the Kaifiyat Express derailed in UP’s Auraiya district early today after dashing against a dumper carrying construction material for railway work, officials here said. Yesterday, 14 coaches of Utkal Express derailed in Uttar Pradesh’s Katauli in which 23 people were killed. While the entire country is in deep anguish at the current juncture and importantly the Indian Railways, the Government Railway Police (GRP) has begun its investigation into the derailment of Kalinga Utkal Express with its personnel visiting the accident site and recording statements of locals in Khatauli, an official said today. Investigating officer (IO) of the GRP, Deputy Superintendent of Police Randhir Singh met shopkeepers, house owners and others for their account of the what had happened on the evening of August 19. “We will file our report against those found guilty for the derailment as soon as we will finish our probe,” Singh said. Thirteen bogies of the train derailed on Saturday in Khatauli near here, killing 22 people and injuring 156, 26 grievously. The GRP had registered a case of death by rash and negligent act in connection with Utkal Express train accident under relevant sections of the Indian Penal Code and The Railway Act. Minister of state for railways Manoj Sinha on Wednesday put an end to the controversy related to cost sharing of Jeypore-Malkangiri new line project. He clarified that his ministry will adhere to the provisions of memorandum of understanding (MoU) signed with Odisha government for execution of the project. Recently, the state government had alleged that the East Coast Railway (ECoR), implementing agency of the project, wants the state to bear 100 per cent of land cost. But it was not mentioned in the MoU signed in October last year. According to the MoU, the state government will bear 25 per cent cost of project and land as well. The rest will be borne by the Centre. But a letter from the ECoR to bear 100 per cent of the land cost created controversy later. Sinha, while inaugurating some railway projects through videoconferencing at ECoR headquarters here, said his ministry never breaks promises. “Some people have started spreading rumors that Railways has changed its stand regarding cost sharing criteria of the project. But it is not true,” he added. He said they had signed the MoU with the state government to give a rail link to the tribal dominated Malkangiri district. “Cost of the land is increasing day by day. Starting the project work by purchasing land has become a difficult thing, but we will do that. We always stick to our commitments,” he added. Jeypore-Malkangiri new rail line project was sanctioned in the Railway Budget 2016-17. The 130km long new line will put the tribal dominated district on railway map. The initial cost of the project was estimated at Rs 1277 crore. But it has now escalated to Rs 2344 crore. The cost of land would be only Rs 242 crore. So far, the Centre has sanctioned Rs 79 crore for the project, official sources said. Delay over beginning of work of this project had created war of words among leaders of the political parties in the state. The BJD had urged the Centre to stick to the commitments agreed in the MoU. Similarly, the Congress had threatened the Centre to take the issue to the streets if it delays construction of the project. Odisha chief secretary A P Padhi had taken up the issue with Railway Board chairman on July 14 and Union cabinet secretary P K Sinha through a videoconferencing earlier this month. Prime Minister Narendra Modi may accept Union Railway Minister Suresh Prabhu’s resignation, who earlier today offered to quit over recent rail accidents in Uttar Pradesh. Sources in the government said Prabhu’s resignation may be accepted ahead of the reshuffle of the Union Cabinet that the government is planning to announce shortly. Suresh Prabhu, taking moral responsibility of a series of mishaps, in a series of tweets, said he met the Prime Minister, but was asked to wait before putting in papers. If sources are to be believed, Modi may accept Prabhu’s resignation just before the Cabinet reshuffle. “I met the Hon’ble Prime Minister Narendra Modi taking full moral responsibility. Hon’ble PM has asked me to wait. I am extremely pained by the unfortunate accidents, injuries to passengers and loss of precious lives. It has caused me deep anguish,” Suresh Prabhu said in tweet. “In less than three years as minister, I have devoted my blood and sweat for the betterment of the Railways. New India envisioned by PM deserves a railways which is efficient and modern. I promise that is the path, on which railways is progressing now,” Prabhu said on Twitter. “Under leadership of PM, tried to overcome decades of neglect through systemic reforms in all areas leading to unprecedented investment and milestones,” the minister added. The development came hours after Railway Board chairman Ashok Mittal submitted his resignation to Suresh Prabhu on a day when Indian Railways witnessed yet another accident in Uttar Pradesh. A man lay injured on a train platform after falling off a moving train in Navi Mumbai, only to be thrown on to another train by railway police fifteen minutes later. He died hours later as a result of the apathy. Action was taken against the constable and two home guards after surveillance footage of the incident, which took place last month, went viral, railways officials said today. The unnamed commuter was trying to get off a speeding suburban train at Navi Mumbai’s Sanpada Station when he fell off and injured himself. He was approached by a Railways Police constable and two Home Guards but instead of rushing the man to the hospital or providing first-aid, the three officials flung the injured passenger on the next train that arrived after fifteen minutes. Onlookers too turned a blind eye to the motionless man. he suburban train was headed to Panvel and was diverted to the yard for maintenance, reported Mid-Day. The next morning, the man was discovered by cleaning staff who took him to Panvel Rural Hospital where he was declared dead on arrival. The incident that took place in the early hours of July 23 came to light after surveillance footage from the train platform went viral. The GRP constable from the video was suspended and the two home guards were sacked, according to Mumbai Mirror. A Mumbai-bound express train from Odisha ran two kilometres in the wrong direction before rail officials realised the mistake and called it back. The incident took place on Tuesday night, when the Puri-Mumbai Lokmanya Tilak Express, leaving Machhapur station in Odisha, went towards Rajkishorepur instead of Raj Athgarh. As soon as the mistake was noticed, the train was stopped and another engine pulled it back to the scheduled route. East Coast Railway spokesperson JP Mishra said the station master of Machhapur has been suspended pending a departmental probe. “It was a case of wrong operation. It was an irregular movement,” said Mishra. The incident occurred on the day when the Azamgarh-Delhi Kaifiyat Express derailed in Auraiya district of Uttar Pradesh leaving around 74 injured. In January, passengers travelling on the Anand Vihar-Bhubaneswar Super Fast Weekly Express in Rourkela junction had a few anxious moments when the engine moved ahead without the 15 bogies. The driver of the train realised only after he gone about two kilometres. Union Minister for Road Transport, Highways and Shipping Nitin Gadkari may get the additional charge of the Ministry of Railways if Union railways minister Suresh Prabhu’s resignation is accepted. Prabhu had offered to resign on Wednesday taking moral responsibility for train mishaps, the most recent being the Kaifiyat Express which derailed on Wednesday, but Prime Minister Narendra Modi had reserved his decision and asked him to wait. Finance minister Arun Jaitley had also reiterated that Modi will take a stand on the resignation later. Gadkari has emerged as a top favourite with several media reports claiming that he may be asked to take charge of the railway ministry. And with a cabinet reshuffle already on the cards, a decision could be announced anytime soon. With Nitish Kumar-led JD(U) now part of the NDA alliance, a cabinet expansion is likely with several new faces finding space in the Narendra Modi cabinet. According to party insiders, talks of a joint infrastructure ministry has re-emerged as well. The new ministry, it is being said, might be created combining shipping, highways, and railways or civil aviation and railways. The possibility of the latter taking place seems higher, especially since Gadkari is part of the five-member ministerial panel, headed by Jaitley, that was tasked with deciding on the process of privatising Air India. But then Gadkari also holds a special interest for transport. So, it can swing either way. Earlier today, Air India chief Ashwani Lohani was appointed as the new Railway Board chairman following the ouster of AK Mittal. If it’s indeed a joint civil aviation-railways ministry, irrespective of which other ministries that fall into Gadkari’s laps, the BJP leader will have a familiar face to start with. Although Prabhu was tasked with the modernisation of Indian Railways since he took over in 2014, however, his tenure has been marred with accidents, nearly 347 of them so far. The Kaifiyat Express derailment on Wednesday came within just five days of the Utkal Express which derailed near Khatauli on 19 August in Uttar Pradesh’s Muzaffarnagar district claiming 22 lives. A two-day long statutory inquiry into the rail accident began on Tuesday in the divisional railway manager’s office in Delhi, however, initial reports claimed negligence from railway officials. The Railways had on Sunday sent on leave three senior officials, suspended four officials and transferred one official following the train tragedy.